Size: It is commonly up to 30 cm long, but may reach a maximum length of 40 cm. 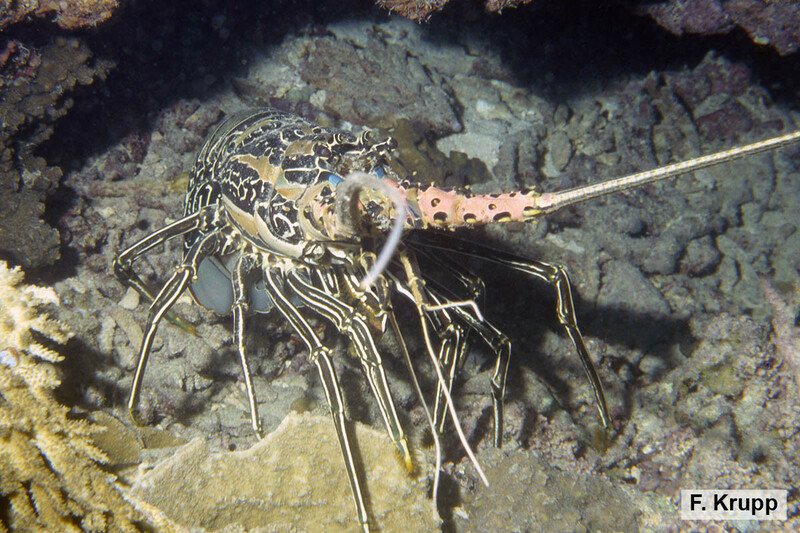 Painted Spiny Lobsters are found in coral reef areas, often on the seaward edge of the reef plateau where the water is clear or turbid with strong currents, usually staying in the shallows at less than 15 m depth. The individuals are active mainly at night, aggregating only in very small numbers and scavenging for food, while during daylight hours they shelter in crevices or under coral mounds, with only the white antennae visible. They hardly ever enter traps and are thus rarely seen in fish markets, though their flesh is highly valued as a food item and specimens may fetch a high price. 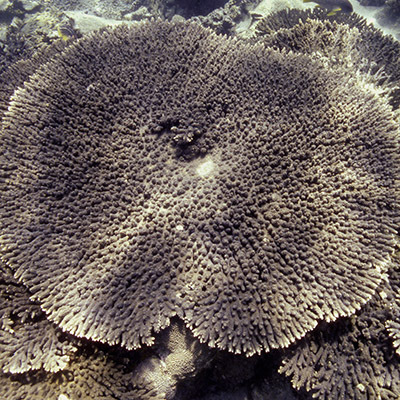 The species is widely distributed throughout the Indo-West Pacific, ranging from the east coast of Africa (south to Natal) and the Red Sea east to southern Japan, Micronesia, Melanesia, northern Australia and Polynesia. The IUCN Red List of Threatened Species classifies the Painted Spiny Lobster as Least Concern (LC) in its global assessment. It is caught as bycatch in trawls and actively fished throughout its range by divers (using hand or spear), but mainly locally consumed. Occasionally it appears in the tropical marine aquarium trade, due to the attractive coloration of juveniles. This species is characterized by a dorsoventrally flattened body, a rounded and spiny carapace without a rostrum, but with a pair of widely separated pointed frontal horns above the eyes. Its legs are simple and lack chelae (pincers), the first pair is not enlarged as in true lobsters. It has a smooth abdomen without transverse grooves across its segments and a soft and flexible tail fan. The conspicuous long and thick spiny antennae are separated at their base by a broad antennular plate bearing two unequal pairs of well-separated principal spines; the slender antennulae consist of a segmented peduncle and two whip-like flagellae longer than the peduncle. The bright color pattern that has led to the species' name is distinctive: body generally deep blue and green, carapace with blue-black patches and white lines, antennae with inner surface pink or whitish and outer surface blue, antennular flagellae whitish, abdominal segments transversed by narrow white bands fringed with blue, legs blue with longitudinal white stripes.